"The aviation units [based in] Misrata [town loyal to the GNA] attacked civilian facilities in the town of Garyan for its support of the [LNA] army. The town residents condemn these attacks, which have caused material damage to public and private property," the LNA military information department said. 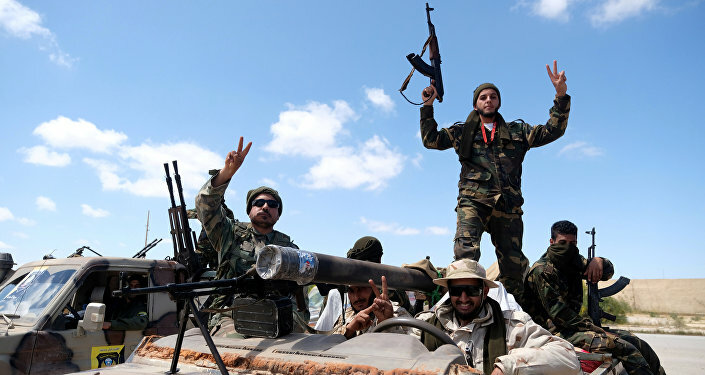 The situation in Libya escalated in early April after Haftar ordered the LNA to move on Tripoli. His army established control over two towns near the Libyan capital. In response, forces loyal to the GNA launched operation "Volcano of Anger" to defend the city from the LNA fighters. In the meantime, the number of displaced people fleeing from the fighting in Tripoli reached 3,400, UN Office for the Coordination of Humanitarian Affairs (OCHA) spokesman Russell Geekie told Sputnik last week. Since the overthrow and killing of Libya's long-time leader Muammar Gaddafi in 2011 Libya is currently divided into two parts — the internationally recognised GNA headed by Fayez Sarraj in Tripoli and a parallel administration allied to Haftar in the east of the country. During a UN-organized meeting in March, both Sarraj and Haftar agreed to hold a general election this spring.